With the Queen’s Jubilee coming up, it feels like it’s the only thing we've been reading about since the beginning of the year. If the hype is not doing anything for you, here are some Bank Holiday alternatives for a different way to celebrate the four-day weekend. Take advantage of everyone else being preoccupied by the royal pageant around the Thames. Head into the city to check out the exhibitions you’ve been waiting to see, but have been avoiding due to the masses. Regular tourist attractions should be a touch quieter than they would usually be, so if you’re completely uninterested in the royal element of the Bank Holiday, now is the time to tick all those things off your to-do list. Head out of town. Although Bank Holiday prices are usually sky-high, there are still last-minute offers available. And with most people getting involved in street parties and festivals in the city, especially in London, there are sure to be deals available on country hotels. If your budget can’t stretch to a weekend away, spend a day outside the festive madness – take a walk in the country or head to your nearest beach. For sporty ladies, take advantage of the time off to go for a long country run or bicycle ride – gear up properly with Puma trainers from Very.co.uk. For more information about these gorgeous shoes, you can click here. Find an alternative festival. Battersea Park may be sold out, but there are loads of other events going on. Try the Apple Cart festival in Hackney for some chilled out fun in the park – without the Jubilee fanfare. Really want to escape? Check out last-minute deals on city breaks in Europe, banking on the fact that most people will be staying in the UK for the Jubilee. Last-minute deals can be incredibly cheap, and with four days to play with, you’ll have plenty of time to relax and thoroughly enjoy the long weekend. Hold your own non-Jubilee party in your garden. We don’t mean you need to burn the Union Jack, but a party for the sake of a party is never a bad thing. If you feel like being really different, why not host a Mexican-themed party? Sombreros, margaritas and tacos will be the perfect accompaniments to an afternoon in the sun – hopefully! Me gustan las de correr rosas, son muy bonitas. hey sweety thx for ur comment! yes lets follow each other.. im following u on gfc by the name priyanka... And also liked ur facebook page.. I love this! The third pair of black and purple sneakers are my favorite! And yes I would love for us to follow each other :] Thank you so much for the comment earlier it means a lot to a newbie like me lol! It's not my first time on the blog and I too find yours very cute. I love the pink shoes, and your blog is really nice!! I also follow you on Facebook and Twitter! Hi!!! Thank you for the lovelly comment in my blog! I am already following you blog, that is a great blog, and I hope you will follow my blog to. Thank you for comment. Of course we can follow each other ;) nice blog! ;) Follow! Just found your blog...it's amazing! Super inspiration! great post! love it..! thanks for dropping by my blog! I like the pink and white jaguar shoes, the lines are very contemporary, but the softness of the colours makes it really pretty. Love the pink ballet flat shoes! These look super cute and comfortable! following you, would love a follow back! Love the pink running shoe! Great blog :) I'm following you now on bloglovin, I hope you follow me back! rocking shoes dear !thanks for ur comment on my blog ! If u want we can follow each other on gfc n bloglovin. Let me know. Puma is not really my kind of brands, but its cool ;) and of course, i wanna follow, I alredy followed you via bloglovin and Google thingy. ciao pretty i love the pink!! thanks for coming by my blog, love! i love the neon shoes! I used to get puma here... hope u having a great weekend holidays and there isn’t wrong parting on our interest. I too get bored hearing a lot on jubilee while browsing. thanks for your blog comment! I have followed you! would love it if you followed back and kept in touch! Cute shoes, especially the pink flats! Thanks for visiting and leaving me a comment on the blog. I hope you enjoy the long weekend! Following you in GFC and BL! Great photos! Thanks for your comment! I used to wear those flat white ones. but in black. i could not find them in a shop any more. Love the shoes, amazing!Thanks so much for the lovely comment on my blog! Thanks a por for tour visir on my blog of course I want to folks each other, starting by now in your newest followers in Gfc and waiting for you. I love the pink sneakers,please let me know what do you think about my last outfit. Amazing shoes!! I loved. Hey you can follow me blog? I follow back. Oh my! I appreciate a more formal shoe. Olá! Obrigda pela visita lá no meu blog. Eu adorei o seu. Realmente os tenis são bem legais. Mas gosto mais do terceiro. I'm in love with the first two shoes! So pretty and they seem to be very comfortable! 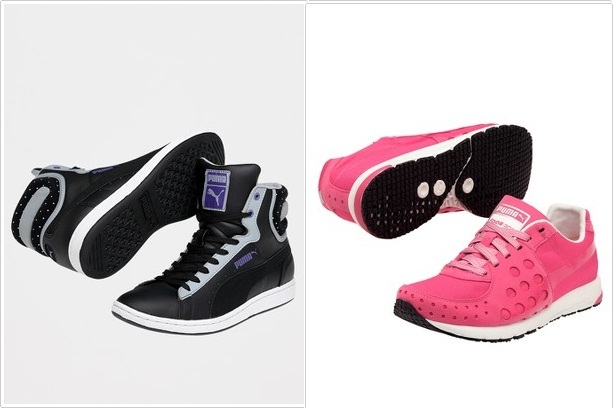 Of course, I love the PINK PUMA. Great for when I go back outside for a walk and jog again when the weather finally cools off. Lovely blog my dear. :) Thanks for stopping by. 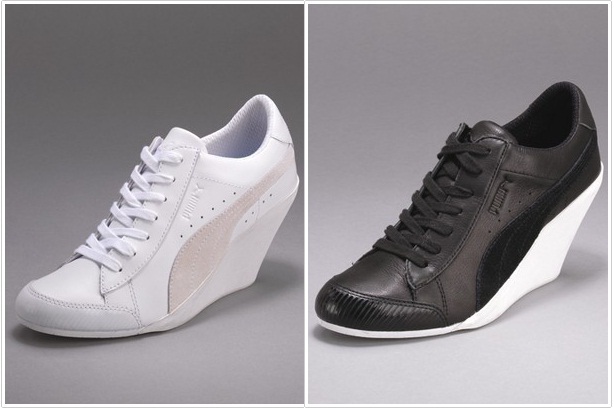 Since heels are the most comfortable for me, I need the wedge pumas! Wedged sneakers! I didn't even know there was such a thing. I love the pink sneakers! it awesome! I think I like the first ones the best! Love those darker pink flats! SO cute!